Twitter’s a great source of curated information and can get quite social when people engage directly with each other through chats. However, it’s not really a network where you find or generate deeper conversations about specific questions you’re interested in. 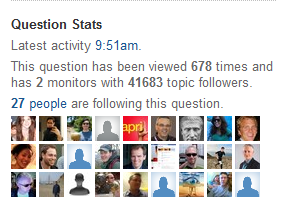 If you’re looking for this kind of experience, Quora may be the social network for you. Quora characterizes itself as “A continually improving collection of questions and answers created, edited, and organized by everyone who uses it.” You can connect to Quora using your Twitter and/or Facebook accounts. You’ll be able to follow all of your Twitter/Facebook friends who are already on Quora. 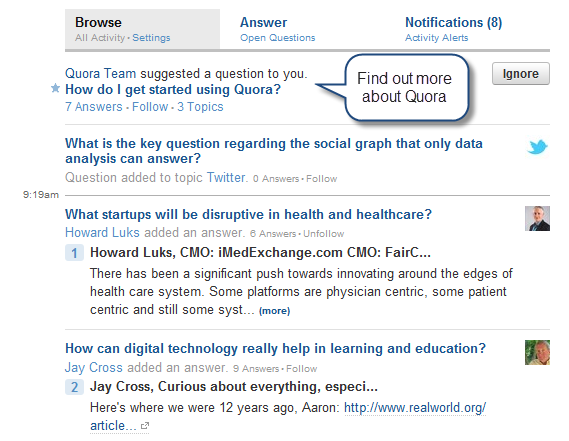 Based on your activity on Twitter and Facebook, Quora initially suggests questions you might be interested in. The very first question is “How do I get started on Quora?” which links to useful information from the Quora team, as well as from Quora users. You’ll find guidelines to help you navigate Quora, devise good questions, and create helpful answers. You should also take a look at the FAQ page for more details. You use the search field to add questions, since your first step in this process is to find out if others have asked the same or a similar question. Here’s where Quora quickly becomes addictive since there are lots of interesting questions being asked that you may want to follow before posting your own. You”ll see some of the already asked questions as you search. If you decide to ask a question, or add a follow-up question to one that’s already been asked, you’ll be prompted with some guidelines. You can always edit your question after you’ve posted it, as I did after realizing I’d used “You” in the question, contrary to what the guidelines suggested. Additionally, you should note that Quora allows others to edit your question and assumes that people will behave in a socially positive manner; i.e., no one person “owns” a question. You can share questions to your other social networks via email or by using the URL. Since I just started using Quora, I don’t have a feel for how quickly questions get answered, but I’ll keep you posted! To find a question that you want to contribute an answer to, either use the search field or browse the suggested questions Quora starts you off with. For example, I was interested in answering one of my suggested questions. You gain access to a basic text box that provides formatting options and the ability to link to other question topics and answers. There’s currently no option to associate an external link with text you’ve added, so you’ll probably want to use a link shortening service like bit.ly if you want to refer people to additional content outside of Quora. You can insert images using the text box to illustrate your answer, although you can’t embed video or audio. Just as when you ask a question, the site provides helpful cues to guide you as you answer. Answers can be anonymous or you can link them to your profile (the default is to be linked). 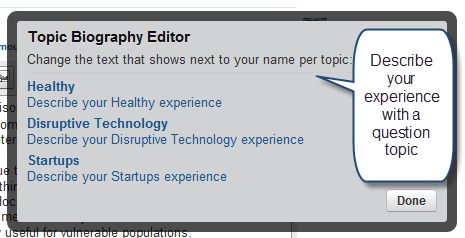 You can add an additional topic-specific bio to help people understand where you’re coming from. When you’ve posted your answer, you can share it on Twitter and Facebook. On the right side of a question page, you’ll find additional options. 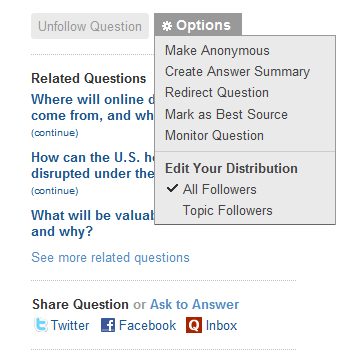 You can follow a question, view related questions, select from an option list, and access additional sharing options. You’ll also be able to view some of the stats associated with a question. A new feature on Quora that’s particularly nice is the ability to post questions and answers to your Tumblr and WordPress blog, if you have one. You’ll be notified of additional community responses to a question and community members can vote whether your answer is helpful or unhelpful. Quora is a great addition to any personal learning network because people join to solve problems, so the community is founded on the idea that people can create, share, and improve on a collective knowledge base via social interactions. Learning to ask and answer questions as you explore a topic is a great way to become an intentional learner. Even if you’re shy at the outset, you can learn from the questions and answers others have created. Although there aren’t the trappings of badges and points, I think Quora does have a game-like vibe that arises from attracting followers as you increase your participation, and there’s certainly a sense of reward that comes from the engagement that ensues when you answer or ask a question or when you answer is voted on by members of the community. You can personalize your dashboard on Quora by adding a profile picture and providing profile information. You can also provide information about your experience with different topics that Quora’s associated with you based on your Twitter and Facebook interactions. This feature creates a sense of identity on Quora. 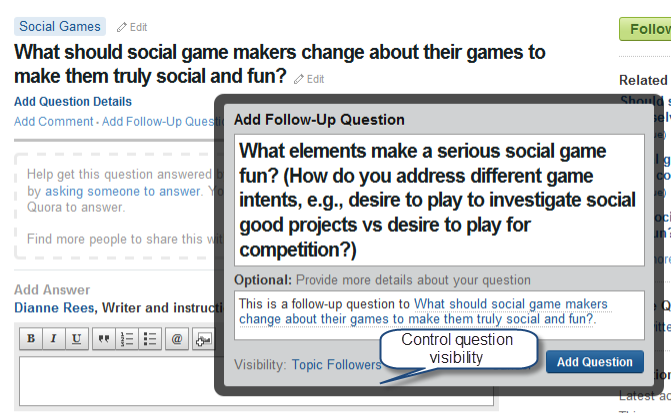 Overall, I think Quora does a good job of creating the flow that enhances social learning.